The OMB-DAQBOARD-2000 is a family of high performance analog and digital I/O boards for PCI based computers. The family includes multifunction boards, analog output boards and digital I/O boards. The OMB-DAQBOARD-2002 is a digital I/O board. The OMB-DAQBOARD-2002 offers two 40 channels of digital I/O and 6 channels of frequency and pulse I/O. The I/O capacity can be expanded up to 256 digital I/O lines using external OMB- DBK digital options. These options are available as TTL-level I/O, relay output, or optically isolated input and output. Forty TTL-level digital I/O lines are included in the OMB-DAQBOARD-2002. They are divided into three 8-bit ports (P2) and one 16-bit port (P3). The P2 ports can be programmed in 8-bit groups as either input or output. The 16-bit P3 port can be programmed as all inputs or all outputs. Four 16-bit counters are built into the OMB-DAQBOARD-2002, each capable of counting up to 65,536 TTL-level transitions. Each of the four counters will accept frequency inputs up to 10 MHz. The counters can also be cascaded, allowing over four billion counts to be accumulated. Two 16-bit timer outputs are built into the OMB-DAQBOARD-2002, each capable of generating different square waves with a programmable frequency range from 16 Hz to 1 MHz. The OMB-DAQBOARD-2002 series sets a new standard with its ability to read digital inputs and counter inputs, while synchronously generating a 16-bit digital pattern output. Most other boards require CPU interaction to access digital and counter I/O making it impossible to generate time-critical digital patterns. 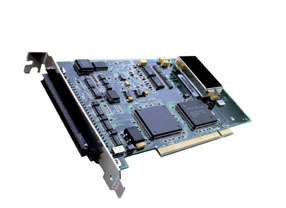 With the OMB-DAQBOARD-2002, the true power of today's PCI-based PCs can be unleashed. Software support is extensive, including comprehensive drivers and new ActiveX/COM-based programming tools for nearly every programming environment under Windows 95 and higher. Included in this list are Visual Basic, C++, Delphi, TestPoint, LabVIEW, and DASYLab, and C++ for Linux. Also included is a suite of DaqView software options for setup, acquisition, display, and analysis of acquired data No programming is required. 참고: All OMB-DAQBOARD-2000s include a CD ROM with all documentation including operator’s manual, DaqView Windows Software, DAQX API library for Windows 95/98/2000/ME/NT for C++, Visual Basic and Delphi and drivers for LabView, TestPoint and DasyLab.